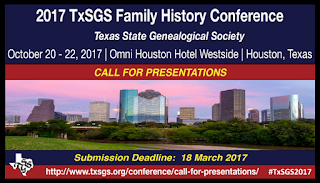 18 January 2017—Austin, Texas—The Texas State Genealogical Society (TxSGS) announces a Call for Presentations for their 2017 Family History Conference. This year’s conference will be held 20-22 October 2017, in Houston, Texas. The deadline for proposals is March 18, 2017. We are looking for dynamic, enthusiastic presenters! If you feel passionate about your area of expertise and would like to teach and inspire other genealogists, this is the venue for you. Seasoned speakers and speakers new to the genealogical lecturing arena are encouraged to submit presentations. Basic genealogical topics (How-To or Getting Started). Ethnic research topics (African-American, Hispanic, German-Texan, Czech-Texan, etc.). Researching in record groups (land records, probate records, etc.). Presentations should be one hour in length. This includes any question-and-answer period the presenter may want to allow. Presenters may submit proposals for as many as five lectures. Please send proposals in the following formats: Microsoft Word, PDF, or Rich Text Format (RTF). File names should include your last name and title of lecture (example: Smith – Understanding DNA Results). Presenters should send a genealogical resume or biography in addition to your proposals. Please include any prior speaking experience. Contact information (mailing address, email address, and phone number). A lecture outline or summary (not more than one page). Audio-visual requirements (projector, screen, etc.). TxSGS will provide a projector, microphone and stand. Target audience (beginner, intermediate, advanced, professional). 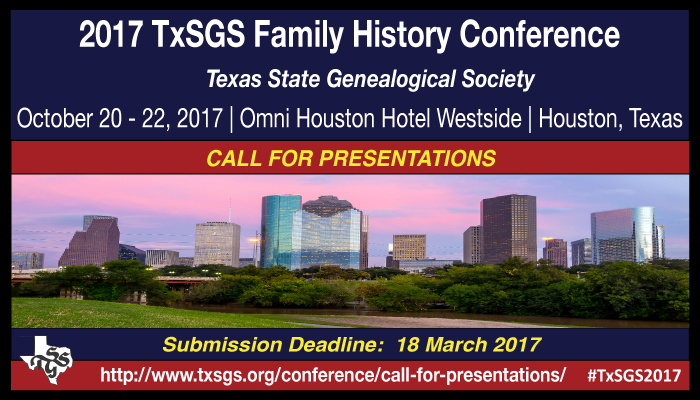 Email your individual proposals as file attachments to the TxSGS 2017 Conference Chair at conference@txsgs.org. Please send one proposal per email. Proposals must be received no later than 18 March 2017. Camera-ready handout for each lecture. Specific guidelines for the above media items will be sent out with your notification of acceptance. Selected presenters will receive an honorarium of $100 for each one-hour lecture. Additionally, a $25 bonus per lecture, will be awarded to the those presenters selected for submitting syllabus materials by the syllabus material deadline. All required dates will be outlined in the acceptance letter sent to the selected presenters. In addition each speaker will also receive a $150 stipend as reimbursement for expenses as well as a free registration to the conference. No other expenses will be provided or reimbursed. Meals that are included as part of the conference registration will be provided. If you have questions, please contact the TxSGS 2017 Conference Chair at conference@txsgs.org. For more information see http://www.txsgs.org/conference/ and https://www.facebook.com/search/top/?q=texas%20state%20genealogical%20society. Debbie Parker Wayne, "CFP: Texas State 2017 Conference," Deb's Delvings, 19 January 2017 (http://debsdelvings.blogspot.com/ : accessed [date]).